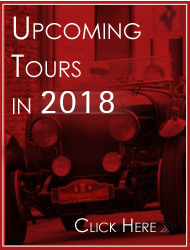 The supplier and Organiser of the Tour is Grand Classic Tours Ltd (company number 7925839) whose office address is: 2 Haslers Court, Ingatestone, Essex CM4 0DS. The following terms and conditions form the basis of a contract with you the client once the client has completed the booking form and returned it to us together with the relevant booking fee and we have acknowledged acceptance to you in writing or by email. When you make your booking you must pay a deposit of £300.00 per person unless otherwise stated. The balance of your travel arrangements must be paid at least 8 weeks before your departure date. If the deposit or balance is not paid on time, we shall cancel your travel arrangements and retain the deposit. It is obligatory that all travellers booking with Grand Classic Tours Ltd hold adequate travel insurance that includes: covering the cost of cancellation by them; emergency repatriation in the event of the customer’s illness or accident; emergency repatriation in the event of illness or accident to any member of their party; All clients should be in possession of a European health insurance card. (Non EEC citizens please check with your Embassy). We also recommend that you take out full continental vehicle breakdown and recovery insurance whilst driving abroad. If you do not take out breakdown recovery insurance you are responsible for the repatriation of your vehicle and passengers and thus agree to indemnify us against any costs that might arise. A valid passport is required for the duration of your stay abroad. Non-EU nationals may require a visa for travel in Europe. You must comply with motoring regulations for travel abroad and carry the relevant equipment. Information is available from your insurers, the AA and the RAC. It is also compulsory to have a full current driving licence, car registration document, motor insurance certificate and current MOT certificate if applicable. Participants must also drive sensibly and within the law and under no circumstances can we accept liability if you suffer injury or death whilst travelling in a motor vehicle whether or not through your own fault or neglect. Grand Classic Tours Ltd cannot be held responsible for any damage to participants' cars or property sustained during the tour including when parked in hotel grounds. At all times participants should be aware of the need to lock their cars when unattended and remove valuables from the car. Where track sessions are available all participants will be required to sign an Indemnity provided for each track session. Essentially this means you will be undertaking these activities at your own risk. Occasionally we will need to make changes to your itinerary and we reserve the right to do so at any time. Generally these will be minor and we will endeavour to inform you as soon as possible. In the case of being unable to provide booked travel arrangements and if we are unable to provide acceptable to you, comparative, alternative arrangements, you will be entitled to a full refund. Changes in transportation/fuel costs or exchange rates & taxes mean that the cost of your travel arrangements may change after you have booked. We act as an agent for ferry & tunnel companies, so the contractual terms of the companies that provide the transportation for your travel arrangements will apply to this contract. We are not liable for the consequences of travel delay affecting the carrier but will do everything in our power to assist. For the Tour to take place we require a minimum of 10 cars. However we reserve the right to proceed with the tour with fewer cars. We reserve the right to cancel your booking if the minimum number is not reached. In the event that we do not reach this number we will notify the client of the cancellation of the Tour within 8 weeks of departure at the latest. If you or any member of your party has special requirements such as existing medical conditions, disabilities, dietary requests, allergies or access assistance, this must be bought to the attention of Grand Classic Tours on booking and agreed in writing. Where possible we will try to arrange for special requests to be met but do not and cannot guarantee they will be unless a supplement is paid. A road book will be provided for you which will include suggested routes but please note the routes are suggested only and you may take whichever route you wish. A book will be provided with event information, hotel information, details of tickets, maps etc. Where cancellation is made by us you will entitled to a full refund. We cannot accept responsibility for loss or expense incurred due in the case of Force Majeure. All cancellations must be in writing and are subject to cancellation charges. Deposit is non refundable. Where cancellation is within 56 days of departure (after final payment), we will endeavour to make refunds but this will be based on cancellation terms and conditions of our suppliers / carriers. Your passport and Visa requirements and any other immigration requirements are your responsibilities. Grand Classic Tours Ltd will not accept any responsibility if you are unable to travel because you have not complied with any passport, immigration or visa requirements. You must be responsible for members of your party and yourself. We reserve the right to refuse your booking or to remove you or a member from any tour if your demeanour or behaviour or that of a member of your party, is dangerous, disruptive or annoying to other people. No refund or payment of any cost incurred by you will be made by us under these circumstances. Complaints must be addressed to the tour manager accompanying the tour who will endeavour to solve any concern on site. All complaints by customers after the end of the Tour must be confirmed in writing and received by us within 14 days of the completion of the Tour. We do not accept liability where there has been no fault on behalf of ourselves, our staff or associated companies and where the events complained of are due to circumstances which neither we nor our suppliers could have foreseen if all due care had been exercised. We need to use personal information such as name, address, passport details, special needs / dietary requirements etc. We will ensure proper security measures are in place to protect your information. However when this information is passed to suppliers of your arrangements who may in turn provide this information to public authorities for custom, immigration purposes as required by law. No information will be passed on to any person who is not responsible for providing part of you travel arrangements. It is not possible for us to process your booking if you do not agree to this. By making the booking you consent to this information being passed on to relevant persons.